It�s perfectly normal human response to be infuriated when an outside agent hurts you, especially if the pain seems unnecessary, illogical or random. Imagine if your neighbor enjoyed setting off loud explosives at all hours of the day and night. Or if he had a habit of tailgating and brake-checking you every time he saw your car on the road. You�d been well within your rights to be infuriated. Or to use a much more common example from the real world : When your politicians repeatedly pass laws that hurt you in favor of large corporations -- that, too, is infuriating. Especially if those actions run directly counter to their campaign promises. There�s a lot of be infuriated about in the world today, so go ahead and embrace your rage. By doing so, you�ll be in a better mindset to understand things like Brexit, Catalonia, and Trump, each of which is a reflection of the fury of your fellow citizens, who are finally waking up to the fact that they've been victims for too long. Spoiler alert: This isn�t some future disaster lying in wait. It�s unfolding right now. Why? Because the math simply doesn�t work. It�s broken, it�s been broken for a long time. You can't put too little in the piggy bank at the start, then raid it over time, and still expect to have enough at the end. 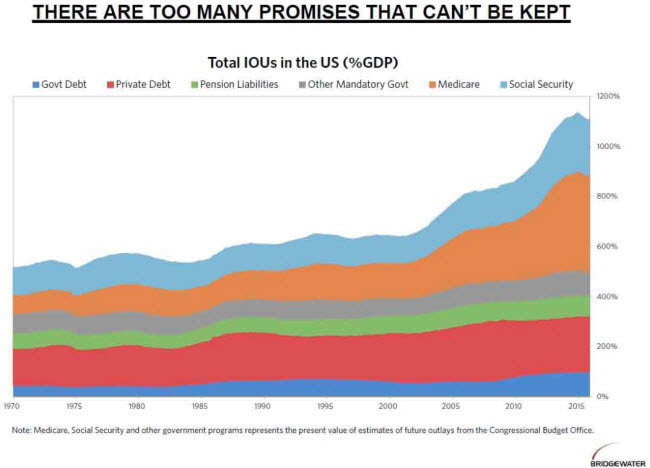 Instead of doing anything constructive about the high number of IOUs building up within Medicare, Washington DC politicians are sidestepping the most obvious elements that contribute the most to the problem. Enormously wasteful, the �healthcare� system is entirely out of control and spiraling deeper into an abyss that threatens to literally destroy the most productive segment of the US social structure: the middle and upper middle classes. Insurers are raising premiums in the face of repeated threats from President Trump to stop funding so-called cost-sharing reductions, payments to insurers that cover out-of-pocket costs for some low-income consumers. Trump previously referred to these payments as �bailouts� for insurance companies and threatened to stop making the payments so as to �let Obamacare implode�. That�s the story the health insurers are going with: they have to raise rates because they're uncertain whether they will get AS MUCH LOOT under the new rules being considered as they did under the utterly disastrous Obamacare provisions. 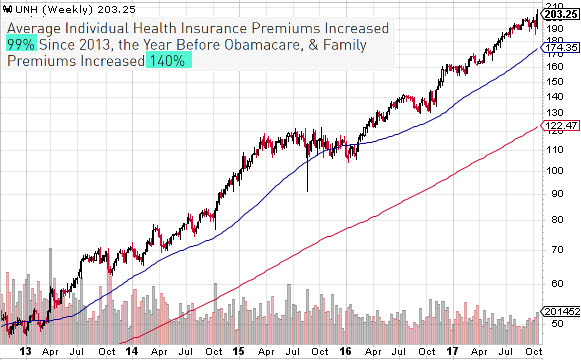 If this chart showing massive near-4x gains in just 5 years, coupled with your steep annual premium increases, doesn�t infuriate you, you are just not getting it. 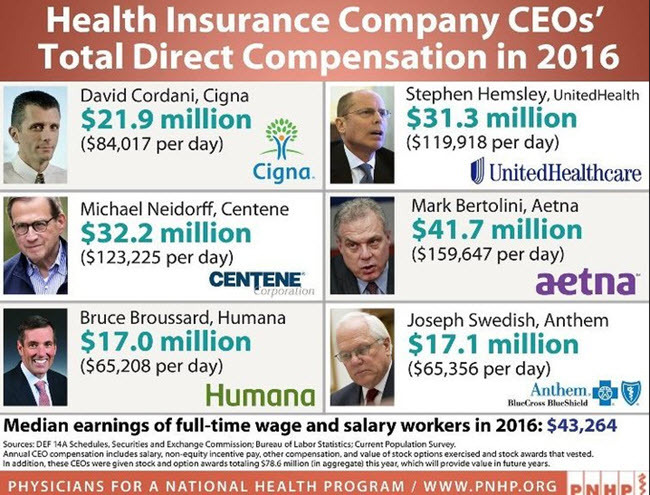 The average family health care insurance premium in 2016 was $18,764, meaning that Mark Bertolini from Aetna alone required 100% of the premiums from more than 2,200 families just to pay him in 2016. Of course, the �C-suite� of these health care insurers are loaded with other high-paid parasites who are just as busy gouging the young and old alike. That�s a no-brainer. Can you imagine if your mechanic had a secret pricing formula for every customer that was, literally, based on their maximum ability to pay? Nobody would stand for it, it�s disgusting that we tolerate this when it comes to something as vital and necessary as our health and even lives. Why there aren�t more politicians willing to call a spade a spade and actually protect their constituents is a real mystery. But the next wave of populist candidates certainly won�t be. People are sick and tired of being asked to give more and more while corporations and wealthy elites keep taking more and more. But that�s not the worst of it. The mistakes we are making right now in terms of energy policy and ecological destruction are far more dangerous to your personal health, liberty and future prospects than a simple market crash.